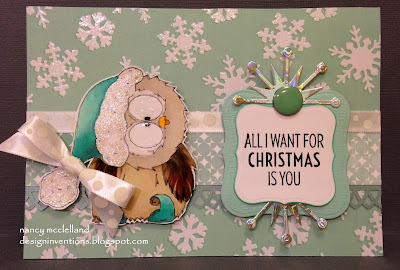 This week at The Outlawz, we are featuring images from Oak Pond Creations. Out theme is 'Winter Snow' and I'm getting ready for some here in Iowa. I chose this cute little Owl, his name is 'Otis' and I love the way his head is tilted. I have made it no secret that my favorite color is Orange, but I am beginning to really like turquoise also. I don't think it has anything to do with the cold weather or snow, I'm just going there alot. I made this card in the process of my recent desk clean, so there are a couple of items that made it on the finished card. I had the silver snowflakes, the white bow and the feathers. I also added the glitter to his hat. Hope you enjoy and hop over to The Outlawz and join the fun. Thanks fro stopping today, Please remember our Veterans today.